"Tales From My Grandmother" author event. Saturday, April 4th! Please join us at Florey's Books as we welcome local author Surrey Blackburn. She will be here to talk about her new children's book "Tales From My Grandmother". Charming stories of life on the home front— Through the eyes of a little girl. 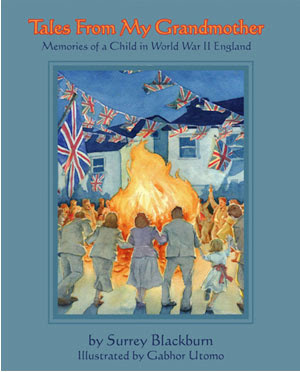 By turns poignant, funny, and moving, these delightfully illustrated tales convey both the everydayness and the harsh realities of life at home in England during World War II. Surrey Blackburn, mother of two and grandmother of five, was born in Bristol, England, and now lives in Northern California with her husband, a dog, four cats, and a lovely view of the Pacific Ocean. After years as a teacher, bank manager, foundation director, and now photographer, she returns with these stories to an earlier interest in working with young children.